A walking tour through a spectacular Geological Park. 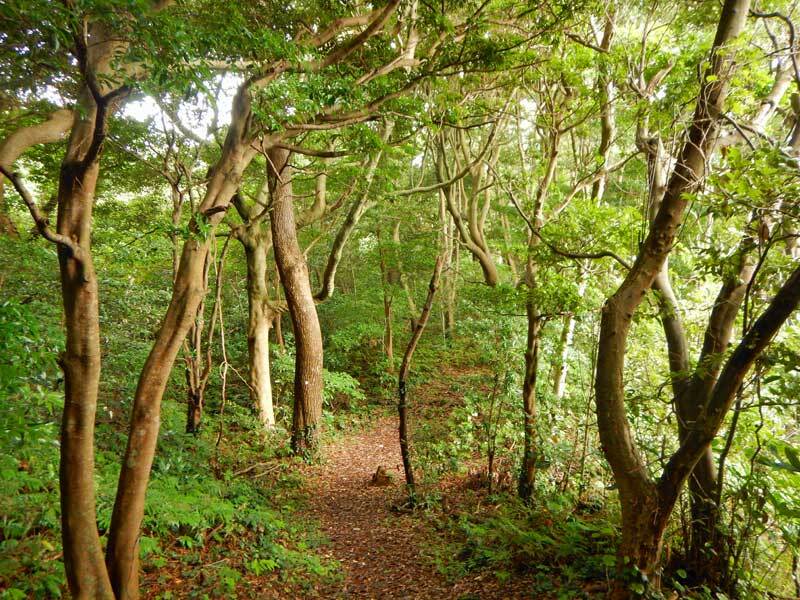 Guided, walking exploration of the fascinating Izu Peninsula; excellent walks along coastal trails. A wealth of interest including spectacular geological formations, beaches, waterfalls, literature and epoch-making history. 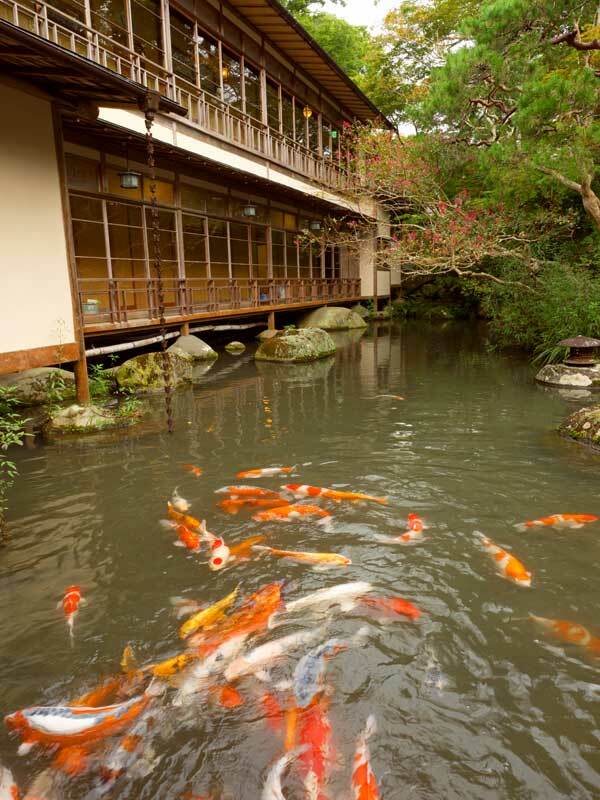 Beautifully located inns, bountiful seafood cuisine and onsen hot spring baths. 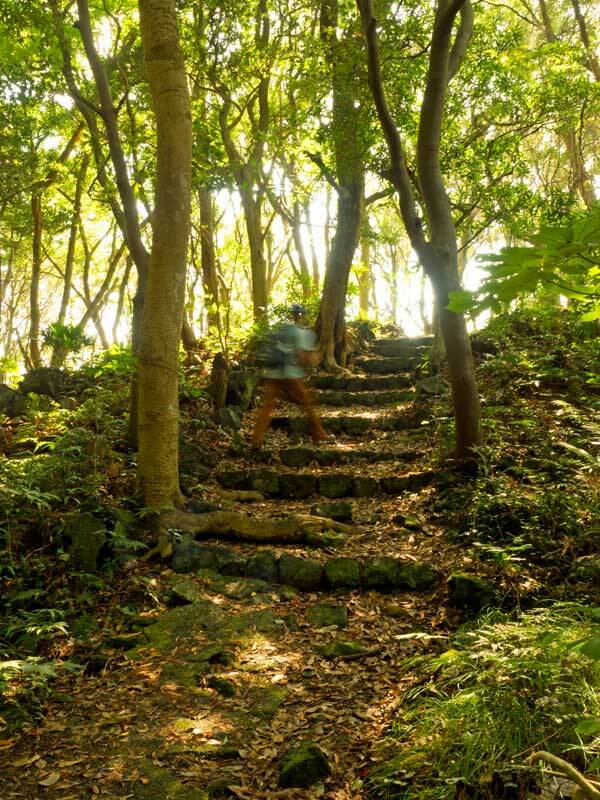 The Izu Geo Trail is a fully-guided tour suitable for anyone who is an occasional walker and can walk for more than three to four hours in comfort. In general, the route is gently undulating but also includes some short, steep ascents and descents. Please read more on tour levels here. A 7-day, 6-night tour starting in Tokyo and finishing in Mishima. Accommodation is in hotels and Japanese inns. The maximum group size for this tour is 12 persons. We have no minimum size. If we accept a booking we guarantee to run the tour. 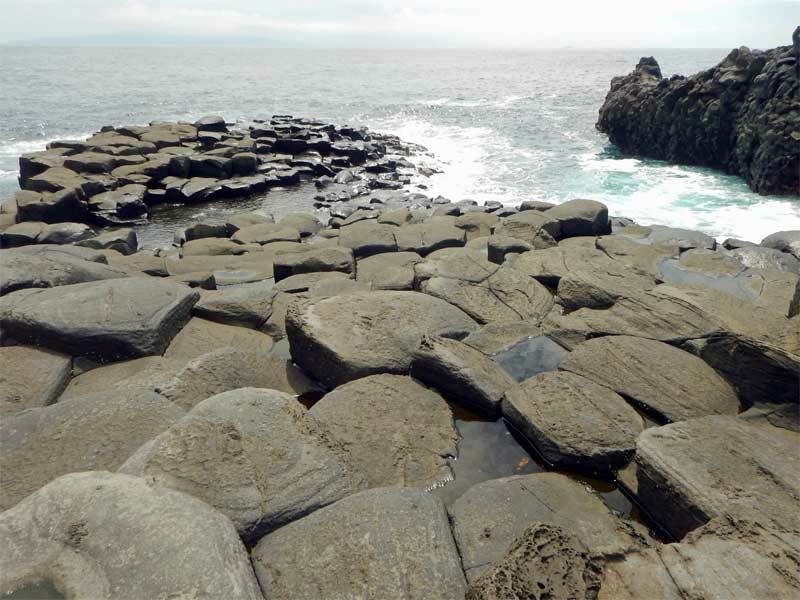 The Izu Geo Trail explores the Izu Peninsula, one of the most unique geological areas on Earth. 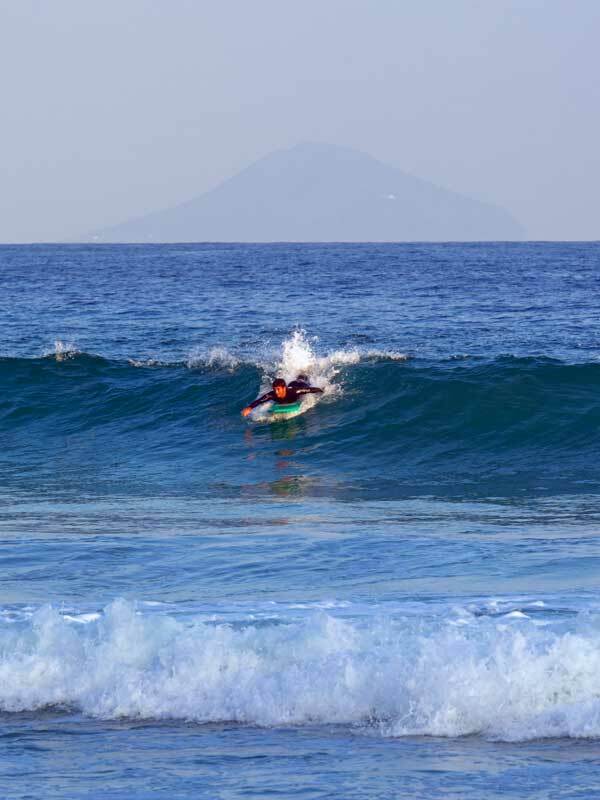 Although only 150km (94 miles) from the giant metropolis of Tokyo, Izu - with its distinctly different landscape and climate akin to a sub-tropical island - is a world away from the capital. 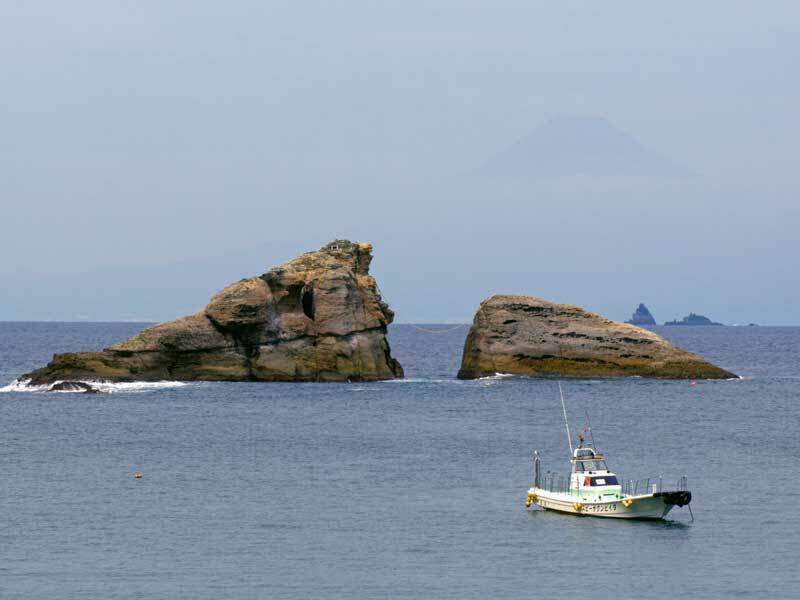 Izu was created by the tectonic forces that still shape the Japanese islands. Volcanic submarine activity some 20 million years ago wrought a landmass that was forced into collision with Honshu, Japan’s main island, as the Philippine Sea Plate pushed against the Eurasian Plate – a process which continues to this day. 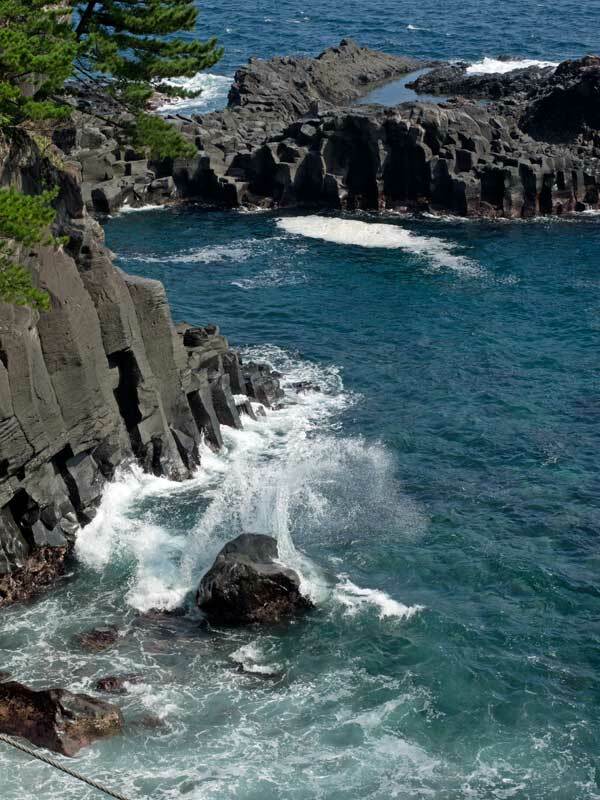 The landscape of this former island, now the Izu Peninsula, is redolent of Earth’s most primeval forces, bubbling with seismic and geothermal activity, peppered with volcanoes and carved by both river and sea. Izu has constantly been renewed and remoulded, and the result is a fascinating geological treasure trove for us to explore and enjoy. 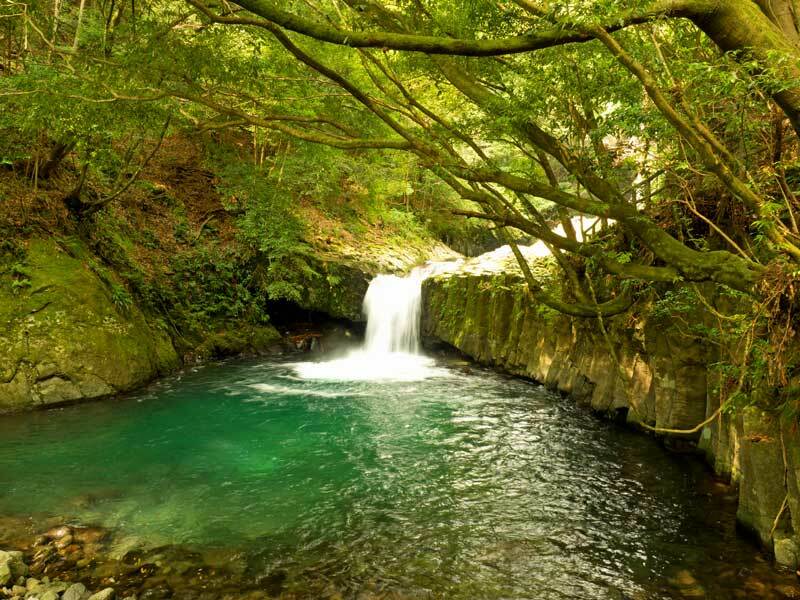 The Izu Geo Trail weaves its way south along the peninsula’s east coast and mountainous central spine to its southernmost tip at Cape Irozaki before returning north along the west coast to Shuzenji, a charming and atmospheric onsen thermal hot spring resort town. The cobalt-blue Pacific Ocean almost completely surrounds Izu and provides the backdrop to a rugged and intricately carved coastline of bays and soaring precipices. Symmetrical columnar cliffs, formed by rapidly cooling lava, tower over the ocean, which has in turn eroded fissures in the cliffs, carving out sea caves that echo to the sound of crashing waves. In the sheltered inlets, tiny fishing villages, evocative of a more sedate age, are watched over by ancient shrines built to protect against the forces of nature and to give thanks for the seas’ bounty. 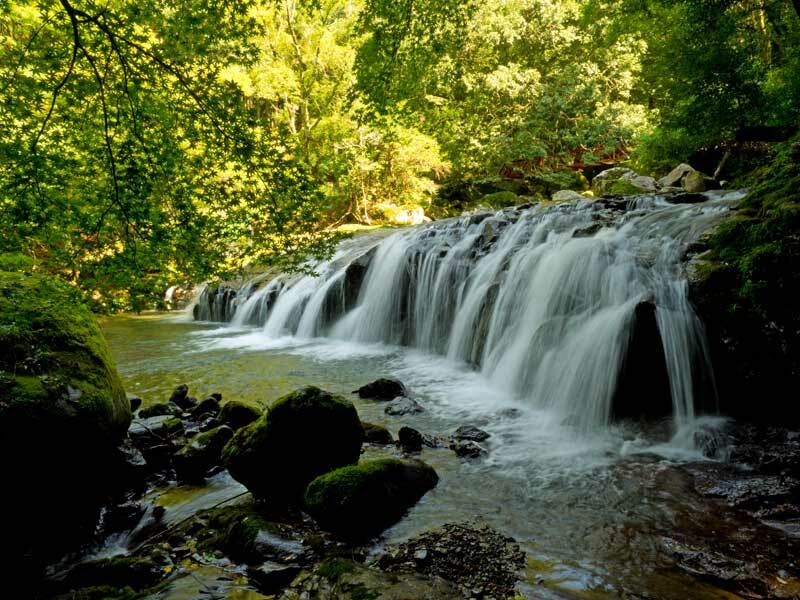 In the peninsula’s mountainous and forested hinterland, myriad natural springs provide a continuous supply of pure water that cascades over numerous waterfalls, through gorges and valleys, to the coast. In the mountains the water nurtures wasabi green horseradish, an essential complement to Izu’s prized seafood. The surrounding seas vary from shallow coastal waters to depths of 2,000m (6,562ft) or more and provide a rich environment for varied and abundant sea life. Not surprisingly, seafood is a significant part of the local diet, so much so that we cannot recommend the Izu Geo Trail to anyone who does not care for it. 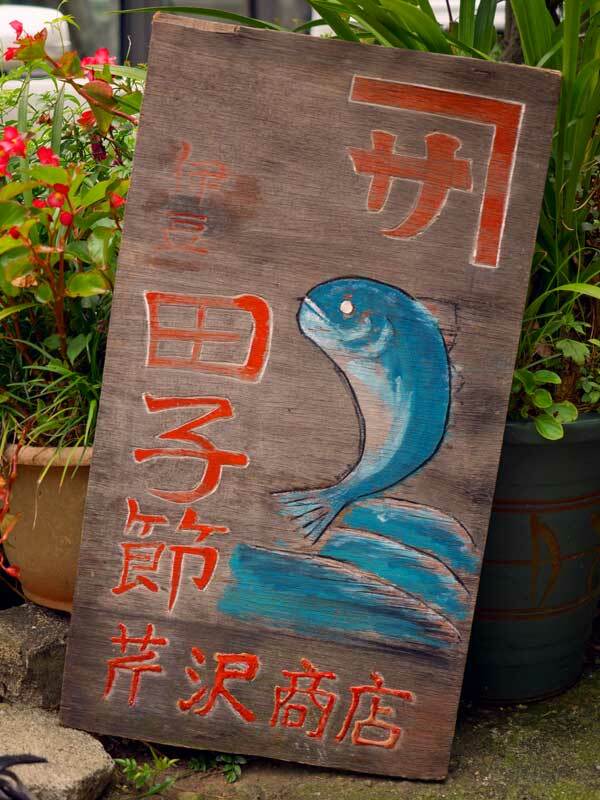 For those who do, Izu is a fish-lovers’ paradise and we enjoy some of the freshest available. Depending on the season our meals may include spider crab, squid, lobster, sea bream and many more varieties. All our accommodation, most of which sit beside the ocean, incorporate onsen thermal hot spring baths for a delightful and leisurely way to relax before our culinary feast each evening. The peninsula was immortalised in Yasunari Kawabata’s short story, The Izu Dancer. The author, who was awarded Japan’s first Nobel Prize for Literature in 1968, fictionalised his own juvenile experience falling in love with a young itinerant dancing girl while travelling through Izu, and from time to time our journey coincides with Kawabata’s route. Izu is also renowned in Japan for the momentous events that unfolded at Shimoda, at the southern end of the peninsula. In 1854, Admiral Perry arrived here with his fleet of kurofune black ships, forcing Japan to open its ports to foreign trade. This shock set in motion the fall of the shogun in 1868 and launched Japan on its rapid path of modernisation and industrialisation. We visit Shimoda, which today is a quiet backwater; its charming streetscape belies the turmoil once unleashed here. 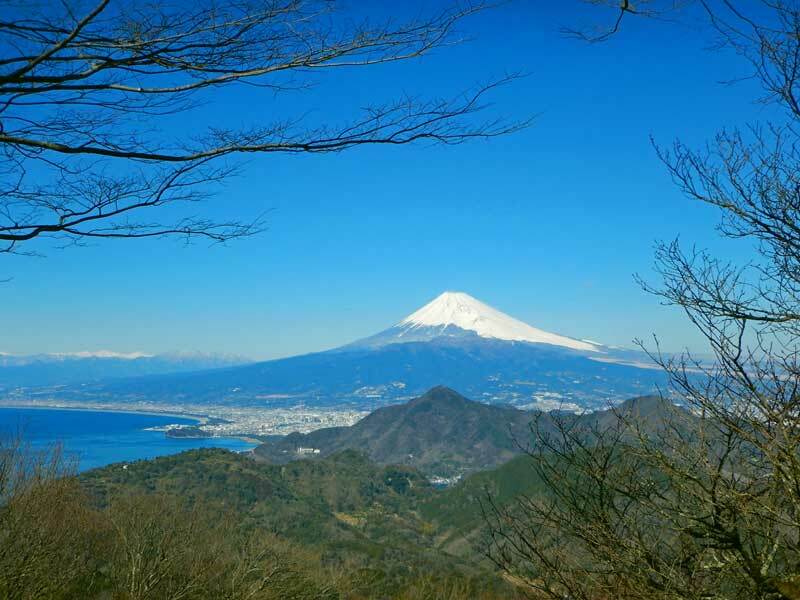 The Izu Geo Trail ventures to some of the most scenic areas of the Izu Peninsula and includes, on clear days, spectacular views of Mt. Fuji. We meet in Tokyo and travel by train to Izu Kogen, where we transfer to a dedicated vehicle which we use for much of our journey, before arriving in Shuzenji, where the tour finishes. This is a gentle walking tour with a moderate average walking distance of 6-12km (3.7-7.5 miles) each day. The route is mostly on uneven forest and mountain trails including steeper climbs and descents. Importantly, the pace is easy to moderate and there is no rush to negotiate any climb. The itinerary for the Izu Geo Trail tour is ground only beginning in Tokyo and ending in Mishima. Prior to the tour, Walk Japan will provide detailed instructions for travelling to the meeting point in Tokyo from Osaka's Kansai Airport (KIX), and Tokyo's Narita (NRT) and Haneda (HND) Airports. At the end of the tour, onward transport to Tokyo, Kyoto and many other regions in Japan is easily made by train from Mishima. Your tour leader will be on hand to advise and help you purchase tickets. The tour starts at 9:00am in Tokyo Station, where your Walk Japan Tour Leader will be waiting at the Nihonbashi Exit. Here we board the Odoriko express train to Izu Kogen. Approximately one hour after leaving Tokyo we reach the Pacific Ocean, and from now on the sea is a feature for much of the journey and the tour as a whole. We arrive at Izu Kogen station by midday and visit a small geological museum adjacent to the station, which provides us with an introduction to the Izu Peninsula, before setting off on our first walk. We stroll through a residential area before quickly reaching a small port, where fishermen and divers congregate, on the Jogasaki Kaigan. This beautiful, jagged coastline of bays and promontories composed of towering columnar jointed rock was created by lava flows 4,000 years ago from Mt. Omuro, a now dormant volcano. 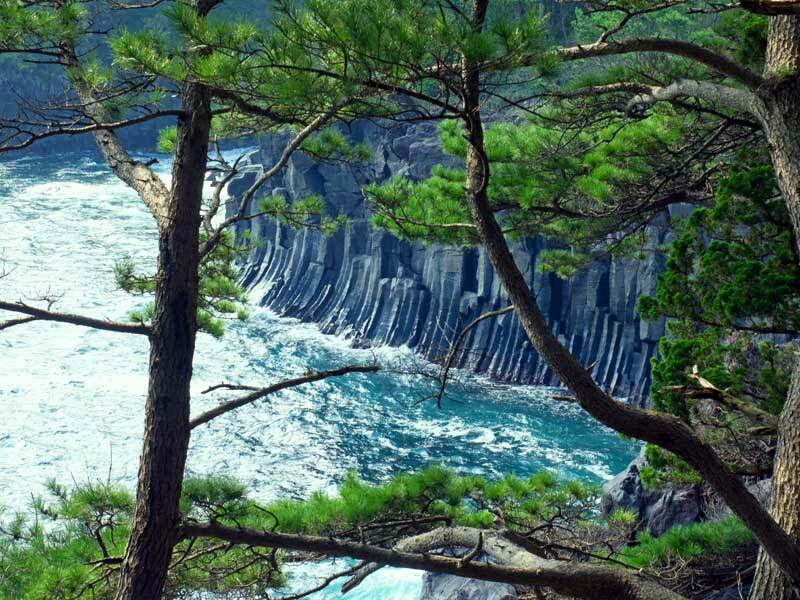 Wind-blown pine trees on the cliff tops create the classic scenery found in traditional Japanese art. Our path follows the coast, crossing an elegant suspension footbridge slung between two rocky headlands. Another headland with views stretching up and down the coastline and over the Pacific Ocean serves as our lunch spot. Our walk today is accompanied by the sound of waves crashing against the rocky cliffs and echoing through sea caves. Nichiren, one of Japan's most influential Buddhists and founder of the Nichiren sect, landed here when he was exiled in 1261. His exile is a reminder that, although our journey here has been easy, the Izu Peninsula was until relatively recently an inaccessible, remote region. We transfer by taxi to our accommodation, a hotel perched on a coastal cliff with open-air onsen thermal hot spring baths, which provide us with great views over the Pacific. We enjoy the first of our tour's sumptuous evening meals in our hotel. Total walking: 4.5km (2.8 miles) / 3 hours. Total elevation gain: 126m (413ft). After breakfast, we transfer by taxi to the Amagi Highlands situated in the middle of the mountain range, which rises like a spine along the length of the Izu Peninsula. An ancient highway following this spine led to the once strategically important port at Shimoda, located near the furthest southern extent of the peninsula. Our walk today largely follows the route of this old road through here. 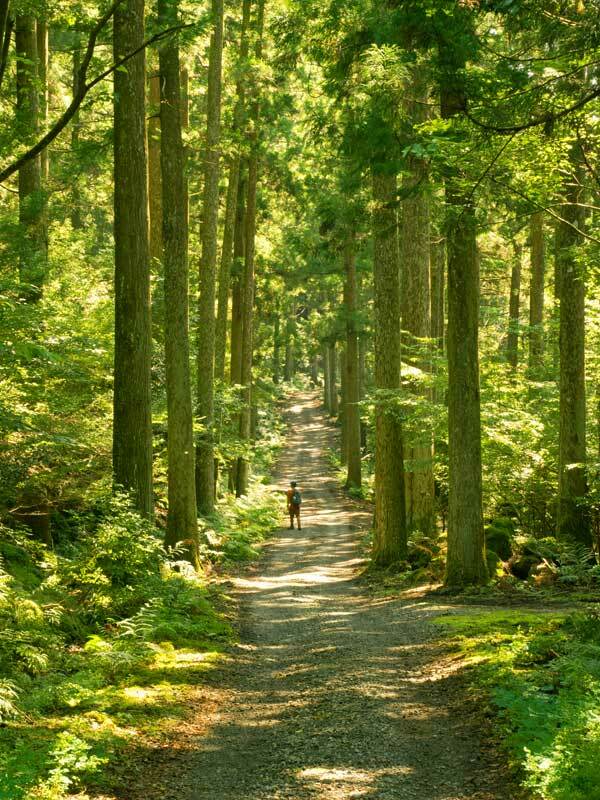 Our walk begins with a gentle ascent through native beech forest that brings us to Hatcho-ike, a pond that is beautiful at any time of year but especially so when surrounded by the autumn foliage. From here our descent, which in part is steep and uneven under foot, brings us to the atmospheric Amagi Tunnel. 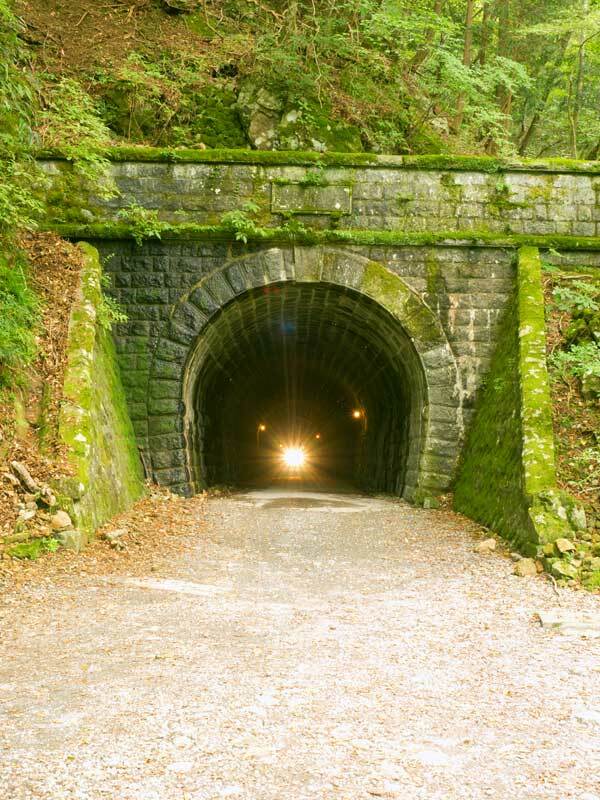 Completed in 1904 using the distinctive, local stone, this 445m (1,460ft) tunnel, circumvents a very difficult section of the old road and significantly eased travel across the Amagi Highlands. The tunnel was also made famous in Japan by Nobel-winning author Yasunari Kawabata, who featured it in his classic, semi-autobiographical short story The Izu Dancer. 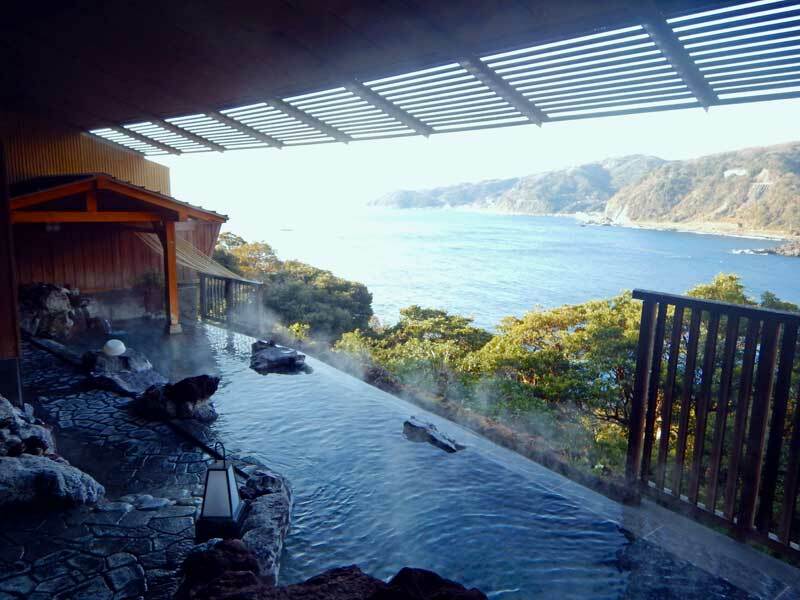 Accommodation: Modern Japanese inn with onsen hot spring baths. Total elevation gain: 449m (1473ft). Today, our walk follows the route trodden by the hero of Kawabata's story. Varying between rough track, mountain trail and paved footpath, it is largely downhill and presents us with a relatively easy route to negotiate. We walk via the Kawazu Nanadaru, or Kawazu Seven Waterfalls, and a gorge which features the columnar jointed rock we saw at Jogasaki Kaigan on Day 1. En route, we come across wasabi horseradish being cultivated in small fields fed continually by spring water. Wasabi is an essential ingredient of Japanese cuisine and Izu is known for producing the best. At the conclusion of our walk, we have lunch at a local restaurant serving delicious soba buckwheat noodles, a popular dish among the Japanese. Here we grind locally-grown wasabi into a paste on small boards covered in sharkskin, to add to our soba. We transfer by taxi further south to Shimoda, the town where, in 1854, Japan's seclusion from the rest of the world was forcibly breached, leading to the eventual downfall of the shogunate, the end of the Edo period (1603-1868) and the restoration of the Emperor Meiji. 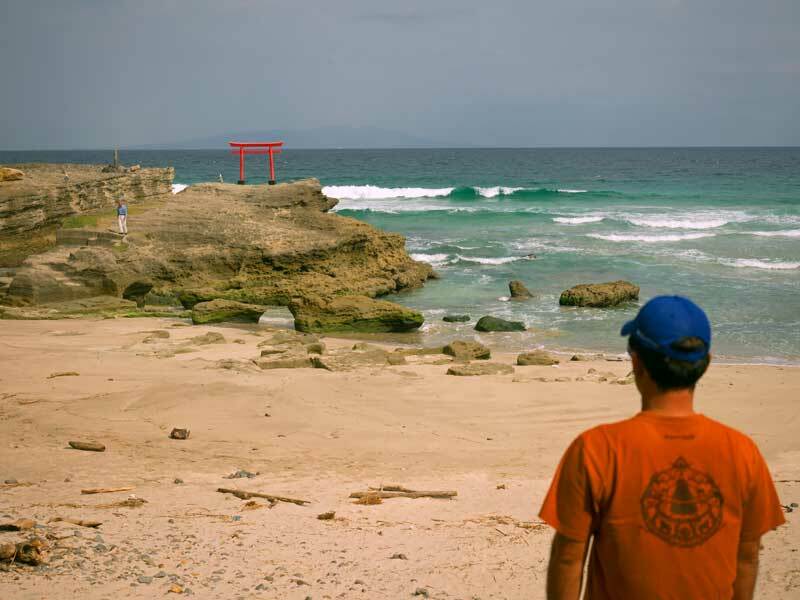 En route, we stop off at Shirahama, a sparkling white sandy beach, and its 1,200 year-old shrine. 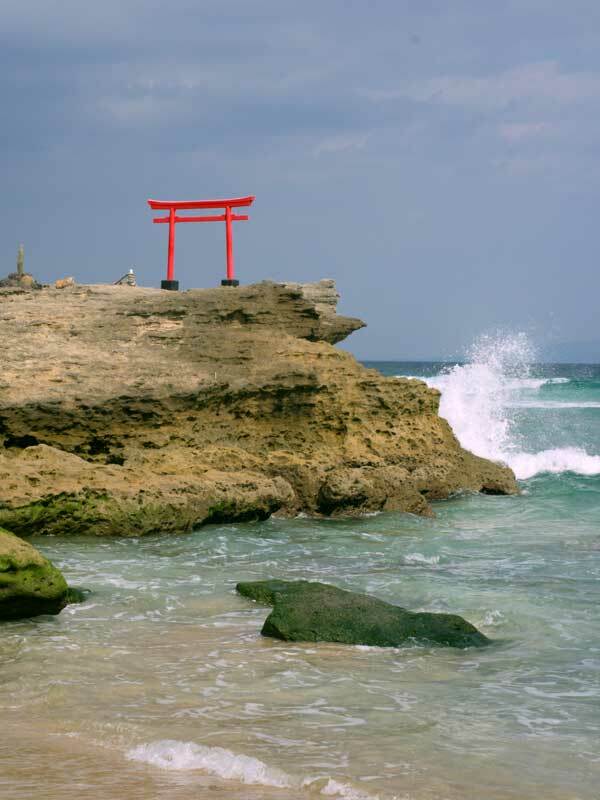 The shrine's torii gate stands lonely and sentinel-like in the face of sea gales and crashing waves: a symbol both of the divine protection offered by the shrine and its embrace of the seas. Nearby surfers seem to pay little heed to it. 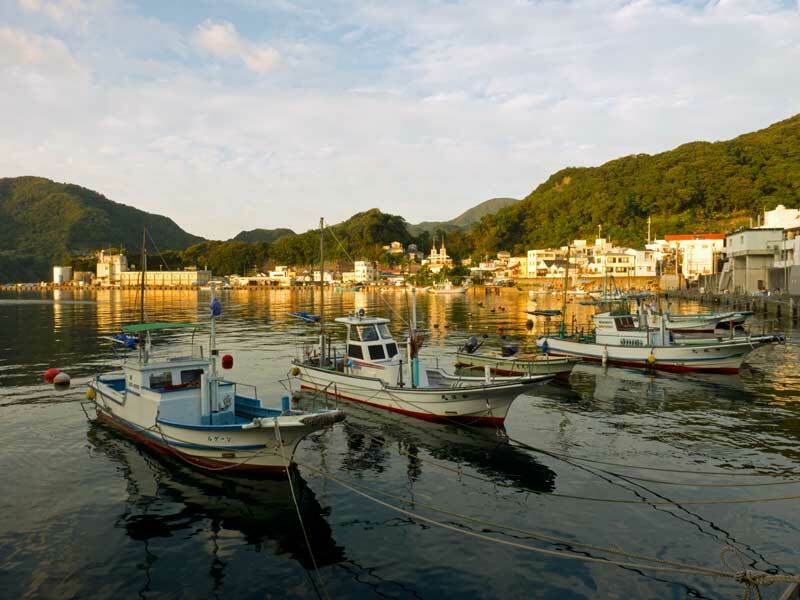 We gently stroll around Shimoda, exploring its harbour and back streets. We also pay a visit to Gyokusen-ji temple where Townsend Harris, first American consul to Japan, lived. Today, Shimoda is a quiet backwater, and the temple and surrounding streets belie the historical events that unfolded here some 160 years ago. Our accommodation tonight is a comfortable modern inn fronting Iritahama, another white sand beach popular with surfers. Onsen baths and a sumptuous dinner in our inn round off our day. Total walking: 5km (3.1 miles) / 3 hours. A stroll before breakfast on the beautiful sandy beach on our doorstep is recommended. Today, a private hire vehicle is with us throughout the day as we continue our journey to the southern tip of the peninsula and start travelling north along its west coast. En route the scenery changes from sandy beaches and coves to precipitous, rugged cliffs with the seas churning at their base. A gentle walk this morning along a coastal trail, where we pause to admire some of the area's unique geological sites. At Toji, we visit an impressive sea cave, where the rock roof has collapsed leaving a cavity to the sky of 50 metres in diameter. Adjacent to this is an expansive sand slope, which is popular amongst children and adults alike for sledding. We continue along the coastal trail through forest before arriving at a pristine, white sandy beach. We return to our vehicle, stopping at a quaint harbour to begin our walk to Cape Irozaki. Izu's southernmost point offers an impressive viewpoint, also the site of a shrine clinging to one of these cliffs high above the Pacific Ocean. Our vehicle transfers us to Matsuzaki, a lovely town known for its many period buildings graced with traditional black clay tiles and white plaster decorative motifs. Our accommodation tonight is at a lovely Japanese inn with onsen baths. The friendly owners go out of their way to provide us with superb local cuisine for dinner. Now that we are on Izu's west coast, with reasonable luck we will experience the sun setting spectacularly over the ocean. Total walking: 4.2km (2.6 miles) / 2.5 hours. Total elevation gain: 156m (512ft). A short taxi transfer brings us to Dogashima, where we begin today's walk along a coast lined with spectacularly eroded cliffs. Our trail takes us up, over the cliffs and down through several coves sheltering fishing communities before arriving at Tago, a sleepy fishing town. Depending on the weather we enjoy a picnic lunch on the quayside or soba buckwheat noodles in a nearby restaurant. From Tago we follow an old trail that begins with a climb from fields of aloe vera through woodlands until we reach higher ground overlooking Suruga Bay. Weather permitting, Mt. 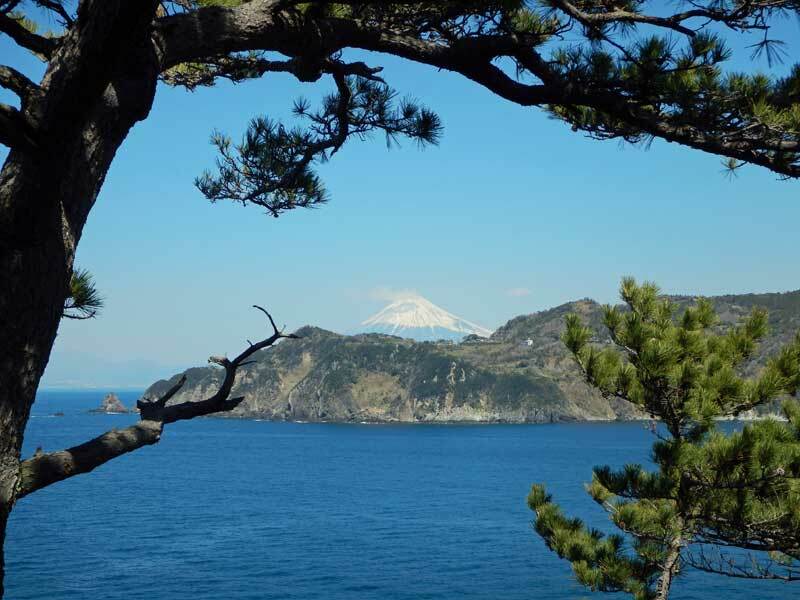 Fuji's elegant and imposing presence dominates our view. Finally, a descent through verdant forests brings us to another sleepy fishing village from where a taxi takes us to our accommodation for the evening. Dinner is yet another feast of local produce. Total walking: 12km (7.5 miles) / 6 hours. Total elevation gain: 570m (1,870ft). We have time after breakfast this morning to explore Dogashima at our leisure. Among the deeply weathered cliffs here is a 200m (656ft)-long tombolo, a land bar that surfaces as the sea recedes. The tombolo, which stretches out from the beach below our hotel, allows us access at low tide to a small island. 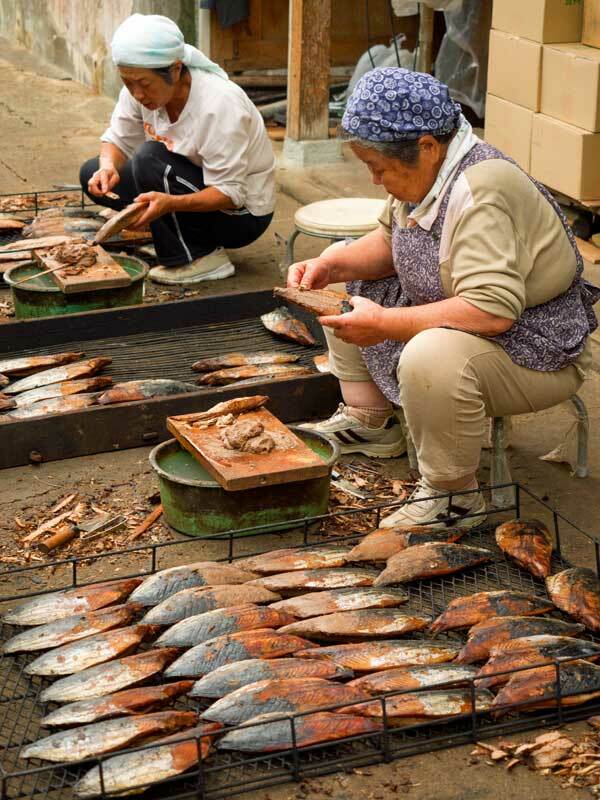 We visit a family-run business that produces katsuobushi, the dried bonito flakes used extensively in Japanese cooking. One of the last traditional manufacturers of katsuobushi left in Japan, the finished product takes six labour-intensive months to produce. We transfer by vehicle to the west-central highlands of Izu for lunch and our afternoon walk. Panoramic views of Mt. Fuji are a feature throughout this afternoon, especially when we reach the 928m (3,045ft)-high peak of Mt. Daruma, an extinct volcano. We then descend to our vehicle to be whisked onto Shuzenji, a small, genteel onsen resort in Izu's hinterland. It lacks the sea view we have grown accustomed to but more than makes up for it with its attractive setting and our accommodation for the night - a historic Japanese inn established more than 160 years ago and registered as an Important Cultural Property by the Japanese Government. Over the years, it has hosted many of the nation's top writers and artists looking for creative inspiration. Our inn is a classic example of the Japanese ryokan with delightful period buildings and gardens to explore. Its onsen are a particular treat, and dinner is a feast suitable for our last meal together on the tour. 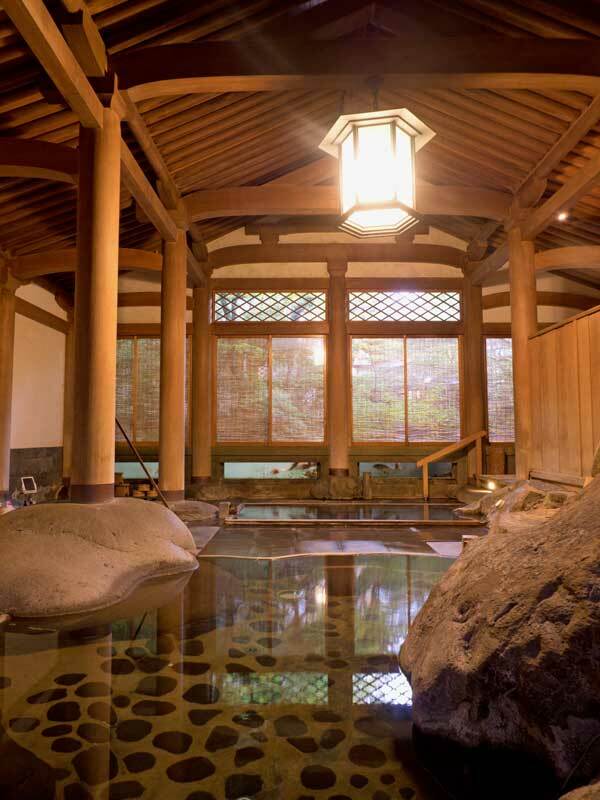 Accommodation: Japanese inn with onsen hot spring baths. Total walking: 7km (4.4 miles) / 3 hours. Total elevation gain: 287m (942ft). After breakfast at our hotel, we transfer to Mishima station, where the tour ends. Onward transport to Tokyo, Kyoto and many other regions in Japan is easily made by train from Mishima. Your tour leader will be on hand to advise and help you purchase tickets. 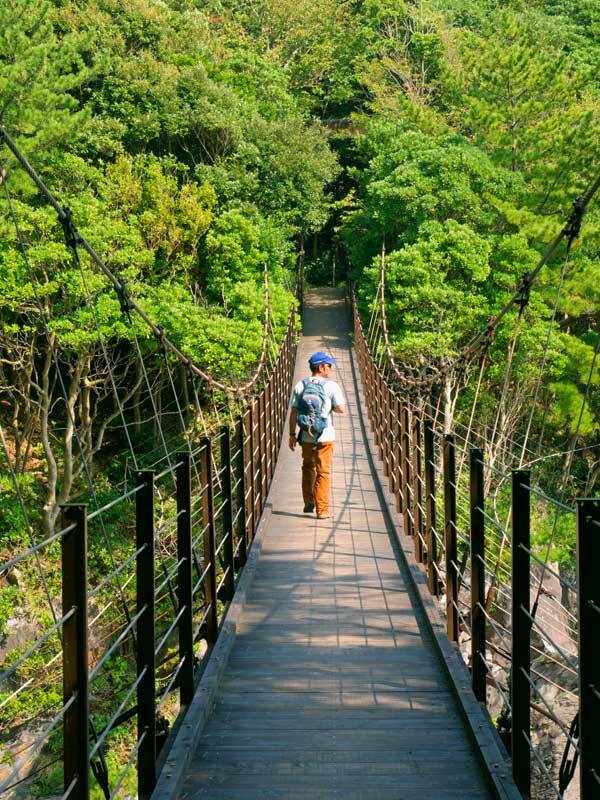 The itinerary for the Izu Geo Trail is ground only beginning in Tokyo and ending in Shuzenji. The airport closest to the tour’s start at Tokyo Station is Tokyo’s Haneda or Narita International Airports, with access easily achievable from Nagoya’s Central Japan Airport, and Osaka’s Kansai International Airport. From Tokyo’s Narita International Airport Narita Express trains depart to Tokyo Station. The journey costs about JPY2,940 per person and takes approximately 50 minutes. From Nagoya’s Central Japan International Airport Meitetsu Line trains depart to Nagoya, where Shinkansen bullet trains then depart for Tokyo Station. The journey costs about JPY12,100 per person and takes approximately 2 hours 20 minutes. From Osaka’s Kansai International Airport Haruka Express trains depart to Kyoto Station, where Shinkansen bullet trains connect to Tokyo. The journey costs about JPY15,970 per person and takes approximately 3 hours 30 minutes. Tour participants are advised not to book themselves out on an early morning flight at the end of the tour, as the journey from Shuzenji to the nearest international airport is approximately 2 hours. 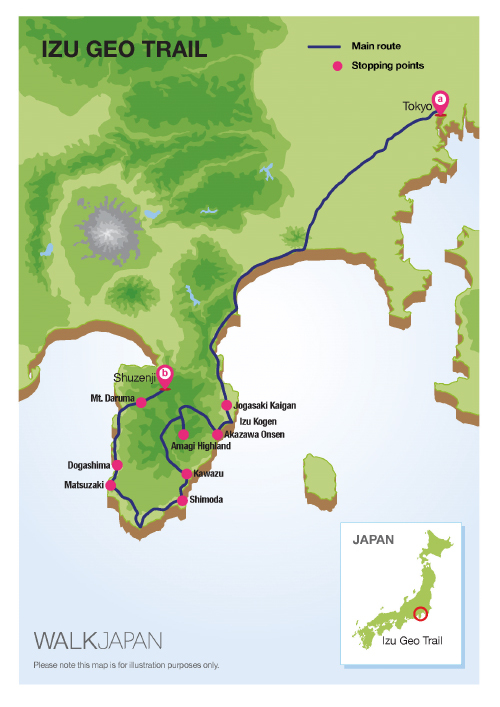 Included: Walk Japan tour leader; 6 nights' accommodation; 6 breakfasts, 4 lunches and 6 evening meals; dedicated support vehicle on 4 days; luggage transfers; entrance fees; travel from tour start point to tour finish point.